Will 2014 be The Year of the Roo? 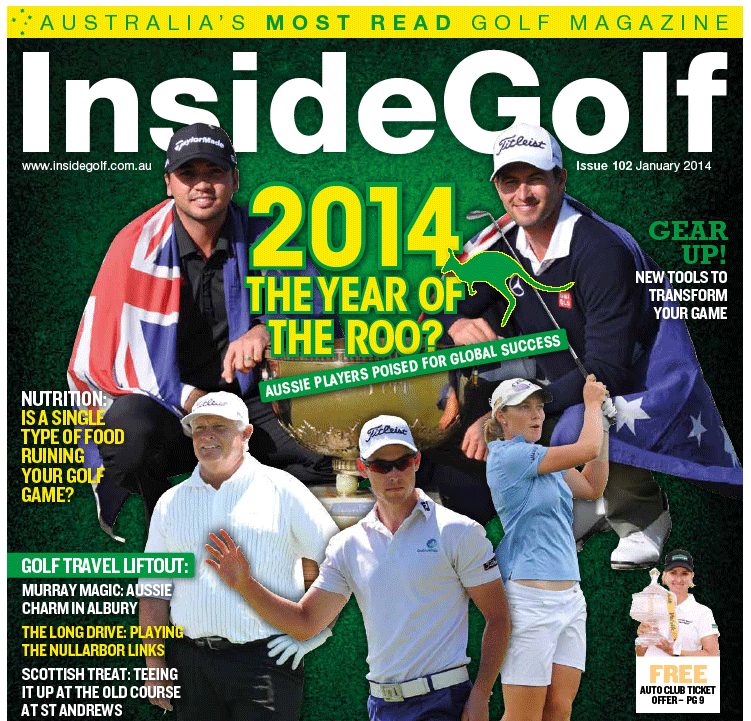 While 2013 marked a banner year for our Aussie professionals on the various tours, 2014 presents an opportunity for even more success. Inside Golf’s Richard Fellner and David Newbery highlight some of the notable players to keep an eye on this year. AUSTRALIAN golf fans had a lot to cheer about in 2013. With a Masters green jacket finally in our grasp, a World Cup title secured on home soil, a rare Triple Crown opportunity in the offering and multiple wins on the various tours around the globe, Aussie golfers were (finally) back in the headlines on a regular basis. It brought back memories of the Golden Ages of Aussie golf, when names like Thomson and Norman helped inspire golfers both young and old to hit the links in an attempt to emulate their new golfing heroes. Luckily for us, 2014 is looking to be even more exciting, as our top golfers are hitting some great form, while some young up-and-comers are proving that they have what it takes to compete on the world stage. Here are just some of the golfers who could make headlines this year, from the established favourites to some of the debutants on tour. Adam Scott: What more can be said about Australia’s highest-ranked golfer? Were it not for a single bad shot/bounce on the 72nd hole of the Australian Open, Scotty would have completed a remarkable Triple Crown and stamped his name on the most successful Aussie Summer of Golf in history. Scotty is without doubt the Golden Child of Aussie golf at the moment, and the exciting thing is that he seems to be just warming up. His game is nearly flawless, and (most importantly) his confidence is sky high. They say “success breeds success” so Scotty will be approaching the Majors this year with vigour, enthusiasm and maybe a hint of a “try and catch me” attitude. Jason Day: Hot off his World Cup victory in Melbourne, Day will be firing on all cylinders this year. Last year he came agonisingly close at both the U.S. Open (T2) and The Masters (3rd), which was similar to his 2011 campaign (second place in both), so Day will be looking to get over the line in 2014. As his “New Father” duties will likely have settled a bit at home (His son, Dash, was born in 2012) Jason may finally have his Day this year. Peter Senior: While he didn’t win on the Champions Tour in 2013, Senior’s name was always on the leaderboard, within striking distance of the top spot. The 31-time winner worldwide knows how to find the podium, and—as he told Inside Golf last month—his solitary goal for the year is to chalk up a “W”. We feel that 2014 might be the year when he finally gets over the line, and if that happens early, expect the success to snowball throughout the year. Stacey Keating: One of the nicest and most talented players around, Keating is another Aussie who knows how to win. A breakout year in 2013 saw her win the back-to-back tournaments on the Ladies European Tour (LET) – the Tenerife Open de Espana Femenino and the Lacoste Ladies Open de France. She also won the Women’s Victorian Open against a strong field. Last month, Keating earned a “Conditional” card on the LPGA Tour courtesy of a high finish at Q School, so expect to see her name on even more leaderboards in 2014. Karrie Webb: Arguably Australia’s most successful golfer of all time, this World Golf Hall of Famer has racked up 39 wins on the LPGA Tour, 55 professional wins and a record eight victories at the Ladies Masters (tying Sam Snead for most victories in a single tournament). Webb will be going for her ninth Ladies Masters title this year, and we reckon she’ll be in the running for more trophies this season. Marc Leishman: With four top-10 finishes last year and eight finishes in the top-25, Leishman lurked on the leaderboards throughout the year. His T4 finish at The Masters was his best for the year, closely followed by a T8 at The Players Championship. He has the skill to shoot the very low numbers, yet this was offset last year by the occasional blowout round. If he can string four good rounds together, he can definitely find himself on the podium on any given week. Marcus Fraser: Another extremely welcoming and friendly individual, Fraser saw himself on the leaderboards throughout the year, but like Leishman, was plagued by the occasional blowout round. Leading after three rounds at The Italian Open, for example, Fraser scored a disappointing 74 on the Sunday (with three bogeys on the last four holes) to finish T8, three shots back. His best finish was T2 at the Ballantines Championship, where he lost in a playoff to Brett Rumford. John Senden: Every year, we expect great things to come from this talented ballstriker. And every year, he seems to miss out by the slimmest of margins. Tee to green, he is as good as any player out there. But his putter has been the one missing piece of the overall puzzle. If Sendo can get his flatstick to cooperate in 2014, then he could (finally) have a banner year. Having earned a spot in The Open Championship courtesy of a solid finish at The Australian Open, we expect him to deliver when it counts. Matt Jones: Here is a very good player who hasn’t won yet on the US PGA Tour but is grooming himself to get there. The 33-year-old is in the prime and form of his life and enjoyed career-best numbers in the FedEx Cup ranking (32) and finished 2013 47th on the money list with $US1.7m. A strong driver of the ball, he made 18 cuts from 24 starts. Aside from driving, Jones, who finished in a tie for sixth at the Australian Open, has a solid all-round game. Matt Griffin: Griffin was a member of the 2012 Golf Australia Rookie Squad. In 2013, the 30-year-old has added polish to his game winning the OneAsia Tour’s Order of Merit with $US257,480. The natural left-hander, who plays golf right-handed, rose to the top of the OOM after winning the SK Telecom Open, a co-sanctioned Korean Tour and OneAsia Tour event. That was the Melbourne native’s second victory on those tours after winning the Charity High 1 Open in 2012. His confidence is sky-high, however, he will need to undergo minor surgery for a niggling wrist injury. He says his goal in 2014 is to do well in the European and Japan Tour co-sanctioned events in an effort to get status there. He is an excellent golfer, one of the rising stars of the game. Aron Price: Price won the 2013 NSW Open with a 19-under par total, which didn’t really come as a surprise as he has US PGA Tour experience. The 31-year-old played on the secondary Web.com Tour in 2013 finishing 68th on the money list, which was mediocre by his standards. He joined the secondary tour in 2006 and in 2008 won the Livermore Wine Valley Country Championship, which helped him to finished 18th on the money list and win a ticket to the PGA Tour. The Sydneysider played college of at Georgia Southern University. In 2004, he won the Rice Planters amateur and the Players amateur. Winning the NSW Open will give him the added confidence to establish himself as one of the leading players on the Web.com Tour. With confidence comes winning – watch out for him in 2014. Nick Cullen: Cullen was a member of the 2012 Golf Australia Rookie Squad. Adelaide-born Cullen played the Canadian Tour in 2010 and the PGA Tour of Australasia in 2011. He overcame a back injury in 2012, and won the Enjoy Jakarta Indonesian Open on the OneAsia Tour and last year captured the Queensland Open, winning by five strokes. He played in the 2012 Open Championship, but missed the cut. A strong iron player, Cullen looks like he is winning the battle with the flat stick. He finished sixth on the OneAsia Tour money list and eighth on the PGA Tour of Australasia money list. Somewhat of a late bloomer, Cullen, 29, has learned to eliminate silly mistakes. If he can stay injury-free, he could have a good year. Ashley Hall: The 30-year-old had a strange year in 2013 narrowly missing automatic promotion to the PGA Tour after finishing 27th on the Web.com Tour. His inconsistency cost him (missed 15 cuts from 25 starts). Still, when he did make the cut he did well finishing the year with two back-to-back runner-up finishes. He finished in a tie for ninth at the Australian PGA behind Adam Scott and tied 10th at the Australian Open. In 2012, the former Victorian PGA champion shot 71-75 at the Open Championship to miss the cut by two shots. If the former mobile phone store worker, who stands at 6’4” (193cm), sorts out his driving accuracy will surely dial in a number of wins on the Web.com Tour. Bryden Macpherson: Ian Baker-Finch has played a number of rounds in the US with Macpherson and likes what he sees. The 23-year-old has already played in two majors – the 2011 Open Championship and the 2012 US Masters. Macpherson had a stellar amateur career winning the British and Australian amateur championships, the Dunes Medal and the Australian and New Zealand stroke play titles. He enrolled at the University of Georgia in 2009 and was named Southeastern Conference Freshman of the Year. A hard worker who keeps fit, Macpherson won an Open Championship spot courtesy of finishing tied fourth at the Australian Open. Nathan Holman: At 22, Holman is the youngest of the group and only turned pro last year. Adam Scott summed up Holman best after the pair played together at the Australian Masters. “Nathan is a really, really, really good player,” Scott said. “I was impressed with him.” Holman was tied for the Masters lead at the halfway and was tied for second going into the last round before fading. He finished in a tied for 14th at the Australian PGA, 15th at the Masters and ninth at the Australian Open. As an amateur, he was ranked 25th in the world and has an impressive amateur CV with victories at the Riversdale Cup, Victorian Amateur, Southern Open, Master of the Amateurs and the Mandurah Open. Inside Golf played a round with this young superstar recently, and we can attest to his amazing skills and temperament. He is a consistent, confident player, which will give him more chances at winning in the pro ranks. Alistair Presnell: Presnell played on the US PGA Tour in 2003 and unfortunately lost his card so it’s back to the Web.com Tour. His biggest thrill was winning the 2009 Moonah Classic on the US PGA secondary tour. At 34, he is arguably entering the best years of his career. Bronson La’Cassie: At 30, La’Cassie earned his card to play on the US PGA Tour in 2014. He got there by finishing sixth on the Web.com Tour’s money list. A University of Minnesota graduate, La’Cassie said he felt comfortable about his chances in 2014. He is a laid-back character and is never rattled because his confidence is high. The key to his success on the main tour is consistency – something La’Cassie needs to find early. Others on the radar include Tom Bond, Jason Scrivener, Jack Wilson, Matt Stieger, Cameron Smith and Matt Miller. And of course, who could forget multiple winners like Brett Rumford and Scott Hend? All these players have something in common and that’s a good head on their shoulders and the courage to take their game to the next level. Some need to do it sooner rather than later as a number of promising amateurs are already making names for themselves playing in pro tournaments. – players like Ryan Ruffels, Brady Watt, Oliver Goss, Taylor Macdonald and others. With such a huge stable of players, Australia is certainly poised for success in 2014. Here’s hoping that we have another banner year for golf!